Outstanding Reviews . 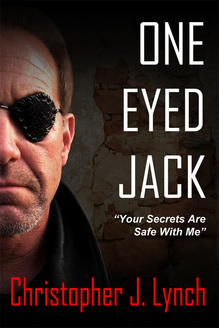 . .
"...One Eyed Jack kept me engrossed from beginning to end...fast-paced...a compelling first full-length novel..."
"I just finished reading One Eyed Jack and I've got to say, I couldn't put it down. Lynch has created a dynamic character in One Eyed Jack. The story had me hooked from the very first three sentences and kept my interest throughout." "...Can there be a villain with a heart? A quick read and an engaging novel... good writing and a great balance with fascinating incidents and suspense. One Eyed Jack is an intriguing read by a very talented writer." "Make sure you have a full afternoon to enjoy this read because you won’t put it down once you open it...one of those stories where you end up pulling for the villain. Intense and gripping book that pulls you in more and more as you flip each page..."
Now available in softcover and ebook!